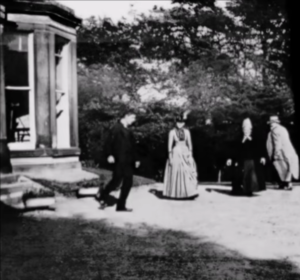 Roundhay Garden Scene is a short movie made on October 14, 1888 in the garden of Oakwood Grange, Roundhay, Leeds, West Yorkshire, England. It was made by a French man named Louis Le Prince. It was silent. The movie had Adolphe Le Prince, Sarah Whitley, Joseph Whitley, and Harriet Hartley walking in the garden of Oakwood Grange. It is the oldest surviving movie. It is 1.66 seconds long. The digitalized version lasts 2.11 seconds. This page was last changed on 31 August 2017, at 22:00.